Trade Justice activists have called for retailers to take more responsibility for the safety of the people who are making the clothes that they sell. The building collapse in Bangladesh, which resulted in hundreds of deaths and thousands of injuries, is a stark example of what can happen when the safety of workers is ignored. In addition to the responsibility of the authorities in Bangladesh, western retail companies who benefit from cheap labour, also have an obligation to ensure workers are safe. 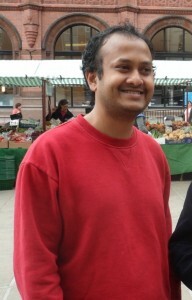 William Gomes is a Trade Justice activist based in York but has lived for most of his life in Bangladesh. 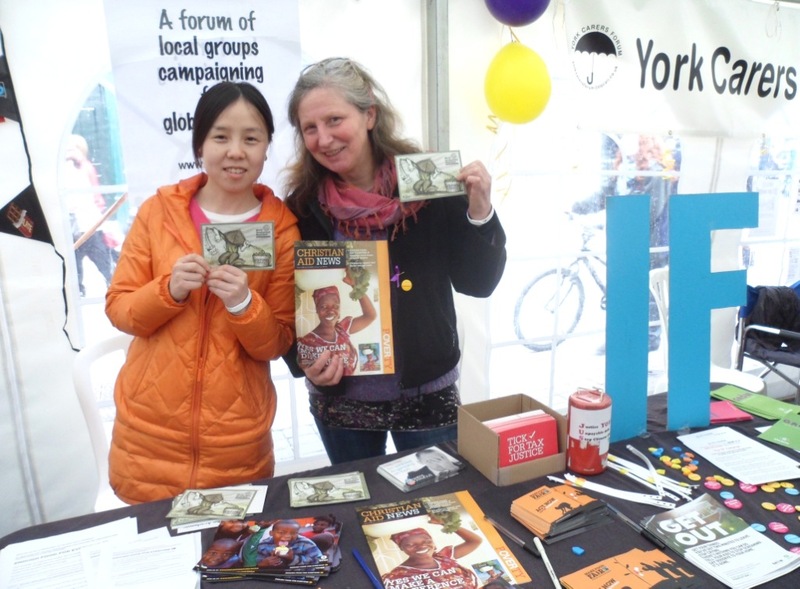 Together with Trade Justice activists, he has visited large clothing retailers in Leeds and York to talk about working conditions for garment workers and calling for the tightening up of ethical procurement policies. Read William’s article which was published in the Huffington Post. 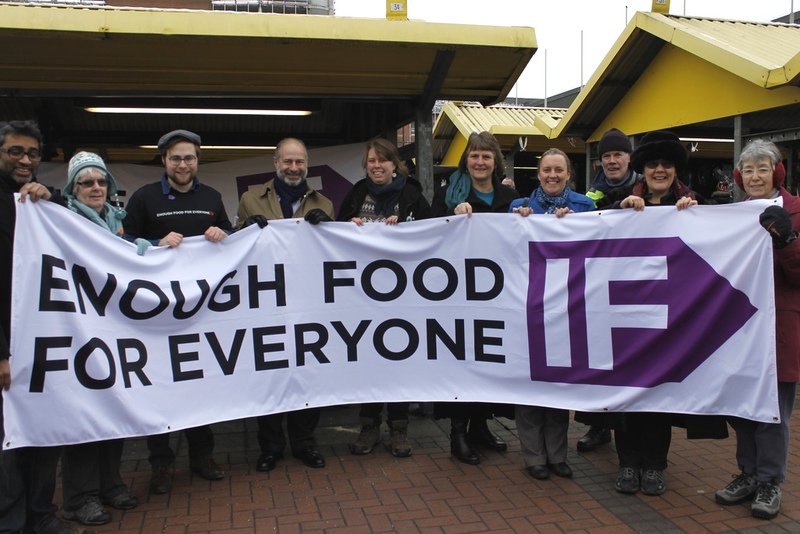 The Fairtrade Foundation is a proud member of the Enough Food For Everyone, IF campaign. The campaign calls for the changes necessary to ensure that no one need go hungry. This includes support for small scale farmers as the Foundation outlines in its Make Food Fair campaign. It is important that everyone reading this website signs up to the campaign. Sign up to the IF campaign now. On Saturday 8th June, thousands of food justice campaigners will be converging on Hyde Park in London to demand change. The campaigners hope to influence the G8 meeting that will take place in Northern Ireland in June. Do you want to be there at this change making event? Check out the website for more details. IF is formed by a coalition of different groups including: the Fairtrade Foundation, Oxfam, Christian Aid, CAFOD and the Women’s Institute. IF we stop poor farmers being forced off their land and we grow crops to feed people not fuel cars. IF governments and big companies are honest and open about some of the things that stop people getting enough food. IF we give enough aid to stop children dying from hunger and help the poorest families get enough food. IF we stop big companies dodging taxes in poor countries. 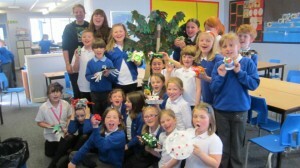 Talented young artists in Rotherham celebrated the borough’s Fairtrade commitment this month. On Tuesday May 21st, at Rotherham Town Hall, pupils from across Rotherham’s schools were presented with prizes by the Mayor and Mayoress of Rotherham, Coun. John and Mrs. Kath Foden. Organised for a second year by the Rotherham Fairtrade Steering Group, pupils at schools across the Borough were invited to submit posters that conveyed the Fairtrade message. The winners and runners-up were presented with prizes and gifts and will see their designs displayed in the John Smith Room in the Town Hall. Rotherham became an accredited Fairtrade Town in 2006. The accreditation acknowledged that Fairtrade is now an integral part of both the authority and the wider Rotherham community, giving ethically-minded shoppers much more opportunity to use and buy Fairtrade goods. 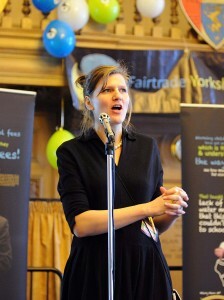 Keighley is the latest town in Yorkshire working to achieve Fairtrade Town status. This comes after Yorkshire was declared the very first Fairtrade Region earlier this year. Involving schools is key to a successful application for Fairtrade Town Status so Fairtrade Keighley has teamed up with Yorkshire based businesses fairandfunky and Small World to deliver an innovative new project: “Fairtrade Orchard”; across schools in Keighley. fairandfunky (www.fairandfunky.com) is a Community Interest Company; empowering people to take little steps to change the world, through interactive and creative workshops on global themes to schools and community groups. The project began on Saturday May 4th at Small World where members of the community are invited to join in a fairandfunky workshop: creating 6 trees from recycled materials. These trees will form the basis of the Fairtrade Orchard which will then be adorned with leaves, animals, plants and flowers in 5 schools across Keighley in the following weeks; culminating in a community event at The Airedale Shopping Centre in June. The 6 trees will come together to create a Fairtrade Orchard representing olive, banana, coffee, tea, lemon and cocoa farmers; and was inspired by the visit to Keighley of Palestinian Olive farmers during Fairtrade Fortnight. The orchard will be at The Bingley Show in July. The workshops have been made possible thanks to funding from the West Yorkshire Co-operative Area Committee; and the Keighley Town Council Oak Fund. 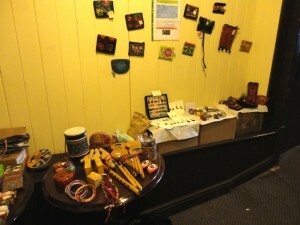 The Folk Festival stall of Fair Trade gifts. 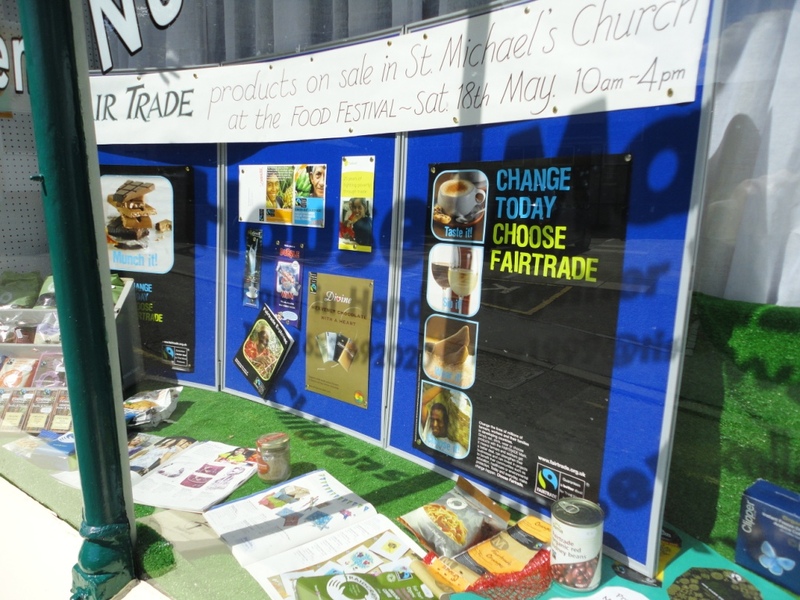 Supporters in the twin towns have been busy in the past month with a flurry of Fairtrade activity. Fairtrade Malton and Norton set up an attractive Fair Trade stall at the Blue Ball pub in Malton as part of the Malton and Norton Folk Festival. There was singing and dancing at the Blue Ball during the day. The group then took the stall to Suddaby’s for the evening folk concert. The impressive window display in Malton town centre. Fairtrade Malton and Norton also set up a display in the window of House Martins, a day nursery in Malton town centre. This advertised their stall at St Michael’s church on Saturday May 18th during the Malton Fine Food Festival. The group sold coffee, tea and cakes made with Fairtrade ingredients at the event. 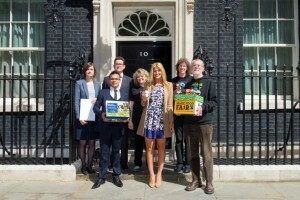 Karen Palframan, of Fairtrade Bradford and Ilkley, was there at the big handover of the Make Trade Fair petition at number 10 Downing Street on 9th May. 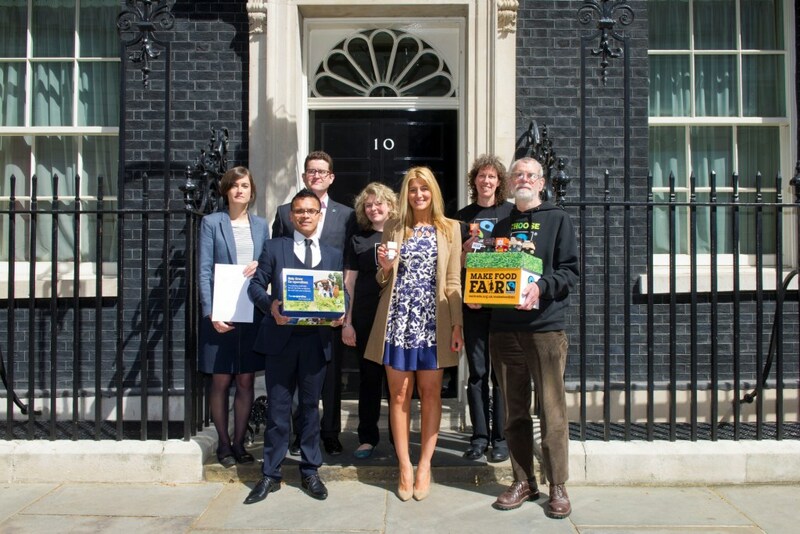 Campaigners, including the “Made In Chelsea” star, Cheska Hull, handed in two petitions containing 75,000 signatures from Fairtrade campaigners and members of the Co-operative. The petitions call on the UK government to use the G8 summit to support smallholder farmers, to feed the world fairly and sustainably. Together with the Enough Food For Everyone IF Campaign, this action has a strong chance of bringing about change in the way food is produced and distributed. 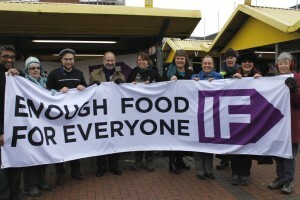 Join the IF campaigners in London on June 8th to remind David Cameron to urge the G8 to reform our broken food system. We need real change so that no one need go hungry. Check out the handover on You Tube. Elect a Yorkshire representative for the Fairtrade Foundation’s National Campaigner Committee. Lunch will be provided – please inform us of any dietary requirements upon registering. Register today to reserve your free place. The United Nations Millenium development goals were set to be achieved by 2015. As the deadline approaches, the UN is discussing what sort of framework should be in place beyond 2015. The Fairtrade Foundation is joining the global Fair Trade movement in calling for a future international development framework that supports concrete means to achieve sustainable and inclusive development. This should include a fairer world trade system enabling the poorest communities to work their way out of poverty. Thousands of local leaders across the globe have been contacted by Fair Trade supporters to sign the Fairtrade Beyond 2015 Declaration. 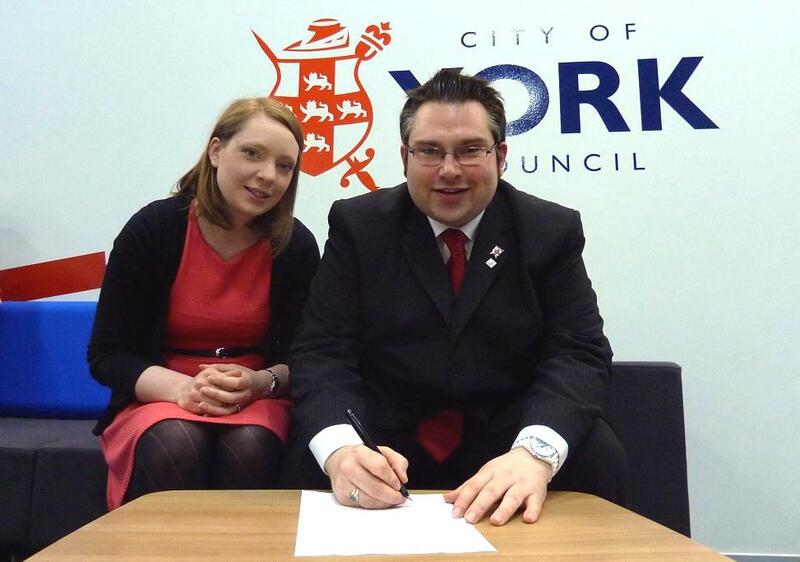 Councillor Linsay Cunningham-Cross and James Alexander, Leader of City of York Council, as he signs the Beyond 2015 declaration. “I have asked the Leader of City of York Council to sign this pledge and make an important statement about global development and the role York as a city can play in that. We want a development framework that enables small producers in poorer countries to trade their way out of poverty, a truly sustainable form of development. It is important that York looks beyond its own boundary in making a contribution to Fair Trade and ethical global development, and this pledge is an important part of that contribution”. 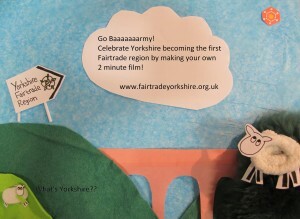 Many congratulations to Ireland Wood Primary School in Leeds who are the worthy winners of the Fairtrade Yorkshire Film competition of 2013. See below for the videos from all the finalists including champions Ireland Wood. Here is your chance to see the Fair Trade story told in this short video. “For a few Pesos more” is produced by BAFTS (the British Association of Fair Trade shops).